OTTAWA — The 2019 federal election campaign is little more than a year away, and yet you could be forgiven for believing it had already begun. On stages big and small — at conventions, at the doorstep, at lunchtime podiums, and especially on the floor of the House of Commons — Canada’s federal political parties are hammering themes they want to dominate the next campaign. Liberal and Conservative MPs really stick to their talking points during question period. Part of the Star’s Parliament in Check series. The Star combed through the political back-and-forth in question period over five days in late April and early May with a view to fact-checking and decoding the theatrics, rhetoric and claims. What our study showed was the surprisingly heavy, if not dominant, use of “talking points” — those centrally coordinated political messages or slogans in constant rotation — and not only by the governing party, but by all sides. Even Opposition parties have turned question period — the time to hold government accountable — into a platform for staged messages, often not listening to answers or riffing off a reply but returning to the party’s scripted message of the day. If it makes for poor watching, it all has a purpose nonetheless: to frame the “ballot” question that the politicians want uppermost in Canadian voters’ minds as we head into a federal election year in 2019. The spoils are rich: the ability to wield power, spend money, pass laws, stride the world stage for four years, and write a chapter for the history books. So the tools used are blunt, no matter how lofty their policy goals. More sledgehammer than scalpel: repetition, exaggeration, rhetorical flourishes, and scornful dismissals of virtually all declarations by their rivals. Paint your opponent as incompetent, self-interested, or anti-democratic and you’re halfway there. And maybe a few strategic ads placed via Facebook or Google will cement those impressions. In the middle of the Star’s review, real drama unfolded. The business of the House of Commons came to a sudden halt when Gord Brown, a Conservative MP from Leeds-Grenville, Ontario, died of a heart attack on a Wednesday morning in his Parliament Hill office. MPs set partisanship aside, delivered heartfelt tributes to Brown, and postponed regular business until the next day. It was a gracious and necessary pause to allow Brown’s fellow MPs to grieve and regroup. It was also a welcome reminder that the Commons is where Canada’s elected representatives come together in common cause, not where they should attack and recoil from the other. But the business of the nation goes on, and they were back at it the next day. So were we. For good measure, we analyzed the following Wednesday, a weekday where Prime Minister Justin Trudeau assigns himself as the lead and only player — a quasi-prime minister’s question time as is done in Britain when only the prime minister takes questions (PMQs) — for a half-hour every Wednesday. The weight of a prime minister’s word in the Commons is hard currency in the political marketplace. And for all its perceived flaws, question period remains a real chance for Opposition members to question the government of the day. A pointed question — even an unanswered one — becomes fodder for news stories, Youtube, Twitter and Facebook — and oxygen for Opposition politicians with few other levers to get their messages in the public’s radar. That’s why we heard “carbon tax” uttered 70 times in five days by Conservatives, with some MPs referring to it multiple times in their 35-second questions. Liberals, especially the prime minister, spun it another way, reminding Canadians 18 times that a “price on carbon pollution” is the cost of addressing climate change. As important as what is said, is what isn’t. Liberals seized on the fact that Andrew Scheer’s Conservatives, to date, have failed to present their plan to reduce greenhouse gas emissions, effectively accusing the Conservatives of being closet climate-change deniers. The Conservatives fired back that Liberals will not say what the cost to consumers will be of higher carbon prices on everyday necessities, like home-heating fuel or gas. The New Democrats, curiously, asked no questions of the government on its climate change and carbon pricing plan. Rather, the NDP challenged the Liberal approval of the Trans Mountain pipeline expansion. They chose to accuse Trudeau of failing to put it to proper environmental review, violating First Nations rights and title, and preparing a multibillion-dollar “bailout” of the controversial project despite the Liberals’ campaign promise to phase-out fossil fuel subsidies. The reason might be found in the NDP’s climate change policy. Lacking much detail, it shows the Liberals and NDP are not that far apart. Both believe in binding targets to cut greenhouse gas emissions, with the NDP claiming its targets would be tougher. Both support putting a price on carbon, but the NDP policy prefers a revenue-generating carbon market, or cap-and-trade. Finally, NDP Leader Jagmeet Singh has picked sides on pipelines. He aligned the federal party with B.C.’s NDP government over Alberta’s NDP premier and opposed the Trans Mountain pipeline project, with an eye on stealing federal Liberal seats in B.C.’s lower mainland next year. In other words, how to tackle climate change, and whether the cost of action or inaction is too high, are issues that neatly package both Liberal and Conservative political messages, and serve up stark contrasts between the two, but provide no great contrast between the NDP and the governing Liberals. And so one of the great policy debates of our day, how to balance the economy and the environment (and one that has played out in every federal election since 2008 when Stephane Dion campaigned unsuccessfully against Stephen Harper’s Conservatives on a revenue-neutral carbon tax), is now playing out mainly between Trudeau and Conservative Leader Andrew Scheer. Make that a replay. Harper may be gone since quitting as a Calgary MP two years ago, but he’s not forgotten. 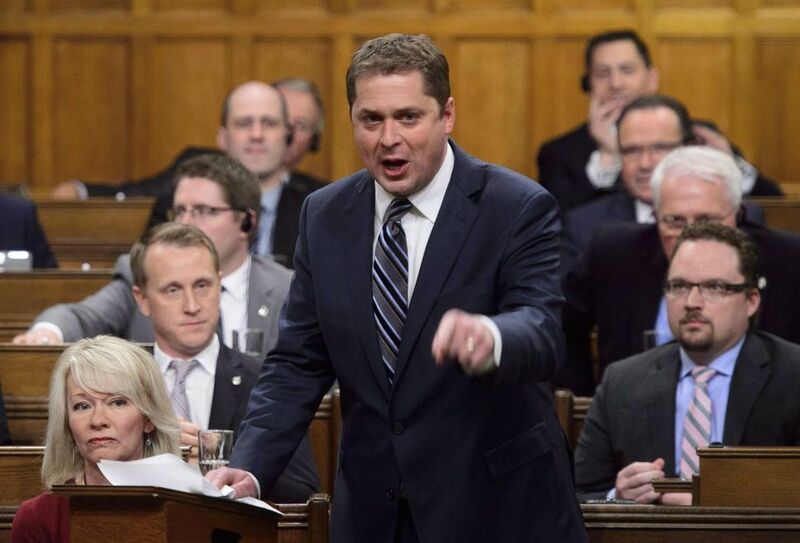 The Liberals have lately revived him as the de facto leader of Scheer’s Conservative party, mentioning “Harper” 46 times in our five-day review. A deep-dive into question period is not like peeling an onion, layer after layer. In fact, it’s more like biting into a watermelon and having the juice splash all over your shirt. The Conservatives even began to mime a drinking game, toasting each time the Liberals used the word Harper. There are occasional zingers. Conservative Pierre Poilievre mocked the Liberal frontbench on May 1 for its failure to answer him. “I am trying to figure out which of these ministers has the answer. Why do we not just ask them all? How much, how much, how much, how much will the carbon tax cost Canadians?” he said, stabbing the air with his hand at the MPs across the aisle. There are rarely great off-the-cuff retorts. Most MPs nowadays read questions from cue cards and ministers often reply with rehearsed answers. The NDP’s Anne Minh-Thu Quach (Salaberry-Suroit) leapt on it: “Mr. Speaker, what we have just heard is awful.” So did the Liberals, for days afterward, hammering the Conservatives for failing to respect women’s “right to choose” and using it to prompt Liberal supporters to donate. If it were real theatre, question period would be comedy, tragedy, drama and farce. The Conservatives view it as prime time to frame the governing Liberals as reckless spenders, arrogant entitled elites who favour their friends and care not a whit for “the average Canadian family.” The Tories barely glance left where the New Democrats sit because they are uninterested in weakening the party they hope will split the left-wing vote. In return, the Liberals paint the Conservatives as cold-hearted mean-spirited lackeys of Stephen Harper. Trudeau’s political attacks have noticeably sharpened this spring. Expect to hear more of that. On their left flank, Liberals mock the NDP during question period for abandoning working-class Canadians, for campaigning on balancing the budget over investing in the welfare of families and communities. Where there’s an opening to take a shot at the NDP as unable to grasp the realities of governing, Trudeau’s Liberals take it. The NDP, demoted in the last election from Official Opposition to third-party status, is struggling to find its feet with a rookie leader, Jagmeet Singh, who still hasn’t sought a seat in the Commons. Singh faced a series of caucus disciplinary messes coming in, and confronts a Liberal government bent on outflanking the NDP as the “progressive” standard bearer, but insists he’s better off rebuilding the party outside the Commons than in it. Meanwhile the Green party’s sole elected MP, leader Elizabeth May, makes her voice heard loudest on environmental and democratic reform questions, but it’s one that rarely finds an echo. What’s left of Quebec’s separatist forces are splintered into two blocs (Québec Debout and the Bloc Québécois), each of which pursues questions mainly aimed at ensuring provincial jurisdiction and interests are respected. None of this was unexpected when the Star undertook this fact-checking exercise. What was unexpected, however, was just how little all political parties lied outright to make their points — contrary to conventional wisdom in a politically cynical age of Twitter, Reddit, Facebook and other social media platforms. Facts do matter. And, in reality, truth remains a valued commodity in the Commons. Sure, there are rules that ensure it. Investigative reporters Marco Chown Oved and Brendan Kennedy were on a team of six reporters that fact-checked question period over five days. See what they thought of their findings. The proposition that someone is “lying” or deliberately misleading the House remains an offence to parliamentary practice. It will get you called out by the Speaker, or worse, booted out, silenced. That might make for good theatre. But being silent is the opposite of what Canadians send MPs to Ottawa to do. They’re there to represent. To debate the great issues of our day. To find truth. To talk. Parler. What were the most common topics?